Making pasta with ricotta and tomato sauce. One of our standard pasta dishes here at Scordo is Pasta with Ricotta, Tomato Sauce, and Parmigiano Reggiano. 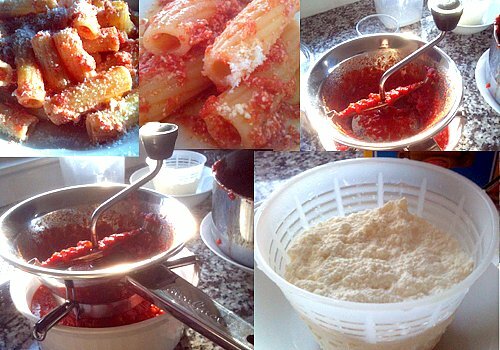 Our ricotta is often homemade (see our recipe) and the tomato sauce comes by way of our canned tomatoes. The pasta condiment produced here is the ideal representation of tomato, rich cream, and hearty flavors (think of it as lasagna or pasta al forno without all the work!). In a large pan, add the ricotta and begin to heat over a low flame. Add a bit of freshly cracked black pepper and stir well. 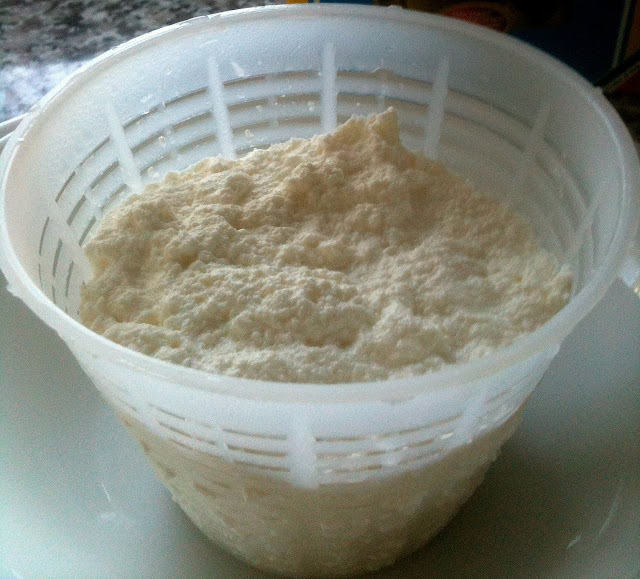 One the ricotta is warm, add the tomato sauce and stir well. Once the pasta is cooked drain it well and save some of the starchy pasts water; add a bit of the water to loosen the ricotta/tomato sauce mixture. Next, add the pasta and stir well. Add the cheese and stir well. Add the extra virgin olive oil and basil and stir once more. 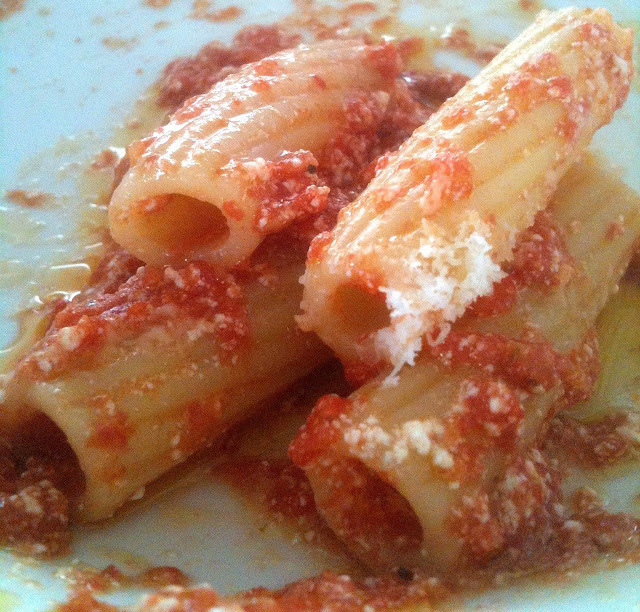 The pasta shape pictured is Tortiglioni from De Cecco. A little but about Tortiglioni from Wikia: Tortiglioni is tube pasta similar to rigatoni. Tortiglioni is narrower in width than rigatoni and its surface ridges spiral around the tube, rather than run parallel to the length as they do on rigatoni. Close up of pasta with ricotta and tomato sauce. 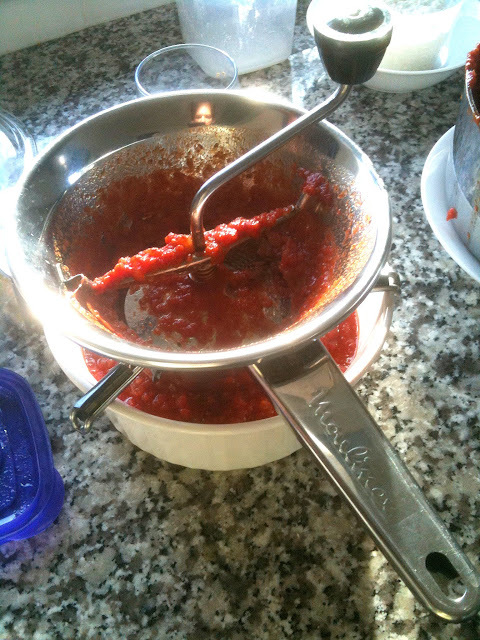 A food mill - key to making great tomato sauce.